The Diana Award Anti-Bullying Accreditation recognises the achievements of Anti-Bullying Ambassador schools across the UK. We offer this prestigious Accreditation, at levels Bronze, Silver and Gold, to schools that have been trained by The Diana Award and are able to evidence their best practice in preventing and tackling bullying and encouraging a positive and inclusive school culture. The Accreditation Scheme runs over the course of three months (March to May 2019 and September to November 2019) and invites schools to accomplish one of the following levels, dependent on current level of Anti-Bullying work: Bronze, Silver or Gold. During the 3 months of the scheme, your Anti-Bullying Ambassador team will be required to collect and submit evidence that demonstrates how they are achieving the set Anti-Bullying Ambassador Accreditation criteria. There is a designated Accreditation Coordinator who will be on hand to guide and support your team throughout the process, ensuring that your school is submitting the correct evidence and that they fully understand what is required of them. HOW WILL IT BENEFIT MY SCHOOL? Designed with our high-achieving Anti-Bullying Ambassador schools in mind, The Diana Award Anti-Bullying Accreditation is one of the most prestigious Anti-Bullying certifications that a school can receive. Receive further support, guidance and resources to help you advance your current anti-bullying work. Have further access to our knowledge and expertise in this area. Will be provided further opportunities for your school to participate in our national events and programmes. 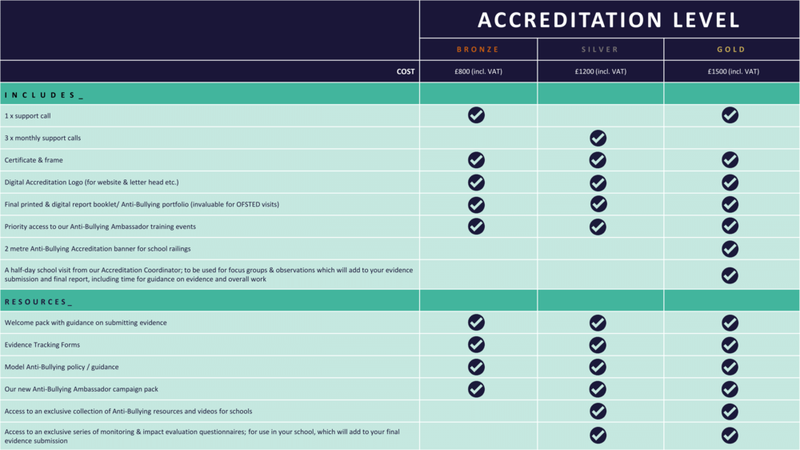 Receive personalised certification, such as a final report, certificate and a banner for your school gates (gold level only). Demonstrate that you are a front-running Anti-Bullying school, with refined policies and procedures in place to support students. Boost the reputation of your school as a student well-being focused school, whilst demonstrating your stance against bullying. Reward your Anti-Bullying Ambassador team for their hard work, through recognition and certification. Our criteria, carefully constructed by our expert team and through consultation with multiple senior education professionals, sits in line with both Ofsted and The Department for Education’s guidance on Anti-Bullying work in schools. Our wealth of knowledge in this area, will guide your school’s Anti-Bullying focus and ensure that you are utilising all opportunities to advance in your Anti-Bullying work. What ARE the criteria for each level? Our criteria have been carefully constructed by our team of Anti-Bullying specialists along with consultation with senior education professionals who fully support our work. The criteria have been designed to complement the official DfE and Ofsted framework for Anti-Bullying guidance in the UK. To ensure that your school will meet the minimum criteria, we ask that a school is active in their Anti-Bullying Ambassador work for 1 year prior to registering for the Accreditation Scheme. When assessing your school’s evidence, our Accreditation Coordinator will invite a panel of Anti-Bullying specialists to score your work. We have a carefully designed marking structure, which ensures that our final evaluation of your evidence is fair and consistent. The Accreditation Scheme is built with inclusion in mind. When marking evidence, we will take it into consideration if you are a Primary school or SEN school. Please see that some Gold level criteria are Secondary schools only. We understand and will take into account that your school is Primary or SEN, if this will affect your ability to meet some criteria. Please get in touch with us, should you have any queries about this. DO WE MEET THE BRONZE STANDARD? DO WE MEET THE SILVER STANDARD? DO WE MEET THE GOLD STANDARD? HOW MUCH DOES IT COST AND WHAT DO WE GET? The registration for our Spring Accreditation Scheme has now closed. Keep an eye on our website and via our newsletter for news about our Autumn Accreditation Scheme. We will open the registrations in June 2019. Before completing the registration form, please ensure that you take time to read through the criteria and FAQs carefully. Upon completing the registration form, you will be asked to agree to the terms & conditions, as set out in the FAQs section. Please note; spaces are limited.